Two weeks ago, my family went away for Spring Break to Lake Tahoe and Yosemite. I’m going to write about Lake Tahoe first because it’s too much to put in one post. Also, I should mention that we had this trip planned for months, but then a few weeks before, we were contacted by Visit California to see if we wanted to partner with them again. Remember when they sent us on a California road trip last year? I told California (yes, we are on a first name basis now) that we were already going and helped solidify our itinerary and hooked us up with some extra perks. Thanks, Visit California! Our impetus for going was to visit my stepbrother and his family, who are currently living in Lake Tahoe for a six month sabbatical. We usually go on a ski trip for Spring Break, but I haven’t skied in Lake Tahoe before and was excited to try somewhere new. Plus, they have gotten TONS of snow this year! My stepbrother is living in North Lake Tahoe, about 25 minutes from Squaw Valley. We spent all our time skiing Squaw, but heard nearby Alpine Meadows is great too, with lots of intermediate trails and tree skiing, but not as many easy runs for Harlow. We were also told that Heavenly (on South Lake Tahoe) has the best view of the lake from any of the ski resorts, but it didn’t make sense for us to go this time around. 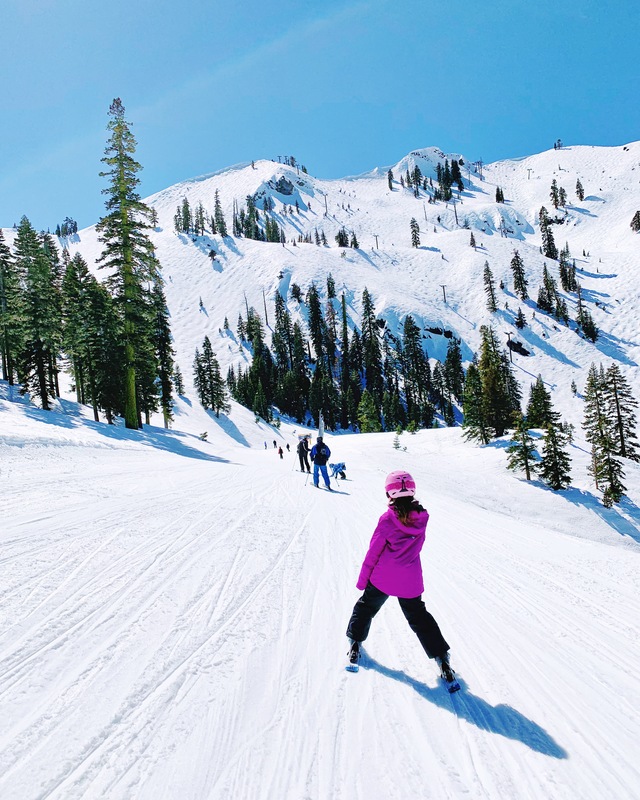 Squaw Valley turned out to be perfect for us, and for anybody with a beginner skier in the family. They have a whole learning area, accessible by an air tram, with three trails, three lifts, a beginner jumping course and snow park (that’s where the snowboarders learn tricks), and a lodge with a beautiful mountaintop view, whereas most ski resorts just have one main bunny slope at the bottom. Taking the air tram is really fun for the kids, because it packs in a lot of people, all hurdling over the mountain in a glass box together. The biggest thrill comes when you go over the top of a ridge and the tram does a pretty wild double swing up into the valley. Don’t worry— they prep you for it before it happens. We stayed with my stepbrother for the first two nights and all skied together on the first day. After a few runs in the learning park, the other kids wanted to move to tougher trails, but Harlow was clearly not ready. I told everyone to go on without us and I stayed back with Harlow. I thought I was going to be stuck there the entire time, but pretty quickly, once we were on our own, Harlow’s ski legs kicked in and she started skiing way better than I’ve ever seen her. I remember when this happened with Mazzy a few years ago. It’s like one second they are a total beginner and the next second, they can suddenly keep up with you. I think a lot of it has to do with control and confidence. By lunch time, Harlow wanted to meet up with everyone else at the main lodge, and they were all shocked to see her there. “How did you get here?” Mike asked. “We skied here!! !” Harlow skied with the whole group the rest of the afternoon. She was slower and we had to ski easier trails than we would on our own, but she hung in there and did great. You can read all about how awesome it was for my kids to ski with my stepbrother’s kids (Hunter and Maia) here. The next day, we put Harlow in ski school, while Mazzy stayed with us. My stepbrother and his family skied with us as well. Harlow was pissed to be the only one going to ski school, but we thought it was important to have her go for three reasons. 1) That’s the way you get better. When you are with instructors who can teach you and you can’t argue with them or tell them you want to go in. 2) I wanted to ski some harder trails. 3) I really wanted to ski with Mazzy. If Harlow is skiing with us, I usually am the one to stay back with her, or take an easier diversion, while Mazzy is excited to ski fast and the tougher stuff. So part of me feels like it’s my responsibility to stay with Harlow, but also I want to give Mazzy the experience of skiing with her mom too. When I was a kid, we used to go on ski trips all the time and I have no recollection of ever skiing with my mother. I think this was because she always stayed back and skied easier stuff with my little sister. And so, we forced Harlow to go to Squaw Kids ski school. They have a sign at the check in area that says “Say Goodbye to your Kids here.” Harlow was visibly upset, even though the staff was making a big effort to make her feel comfortable, and I wasn’t sure how to walk away from her. I tried to explain that she needed ski school so she could eventually ski all day with us too, but she was not having it. So you know how you promise your kid something out of desperation? I promised her a Bravery Stuffie. Somehow that worked even though I had no real idea what a “Bravery Stuffie” was or how I was going to get one by 3:15pm when we were spending all day on the mountain. Luckily, on my way to pick up, I found a little toy shop in the ski village and found a whole bunch of options, including the little kitten below. Harlow named it Brave. Also, she told me she had a great time at ski school, she like her teacher (always a big plus!) and was excited to go back the following day. She stuffed Brave into the inside pocket of her ski jacket and skied with him for the rest of the trip. On the ride back to my stepbrother’s, we made sure to stop at the lake, which is unreal looking. Like the actual lake looks like someone replaced your line of sight with a postcard. It’s so still and serene and the sky and the water look exactly the same. We stayed there to skip rocks for a bit, because Lake Tahoe has perfect rock skipping water and perfect rock skipping rocks. We also discovered that Mike is a rock skipping savant. Somehow he can toss a rock and make it skim the water like magic, effectively skipping like 20-30 times. The rest of us did not have that much luck. Harlow gave up on skipping and just aimed to find the biggest rock that would create the biggest splash (basically the opposite of skipping rocks) and Mazzy found me a beautiful heart-shaped rock that she insisted I take home. Nothing like a boulder to pack in your suitcase for the trip home! That evening, we switched locations to a condo at the Squaw Valley Lodge, which was right on the mountain and ski in, ski out. That’s the best possible set up you can have at a ski resort. The condo belongs to a fiend of Mike’s and it happened to be sitting empty that week, so we got an awesome deal. The next day, we put both kids in ski school so Mike and I could ski on our own. This way we could do even more challenging stuff. Personally, I love skiing moguls and the back of the mountain where there’s more ungroomed terrain. As for food, there is tons of good restaurants in Lake Tahoe. We went to Rosie’s Cafe in Tahoe City, which was great for the kids. They have burgers and salads and a rec room upstairs to send the kids to play. For a fancier meal, we went to Sunnyside, which has a beautiful view of the lake. I bet it’s extra special when you can sit outside in the summer. We also ate a few times in Squaw Valley village because it was super easy and we could just walk from our condo. We got pizza at Fireside and sushi at Suko Yama. On our last day of skiing, we skied all together as a family. It was tons of fun to watch how much Harlow had improved over the trip and to see her keep up with Mazzy, even leading her on a few routes through the trees. Both my kids love skiing through the trees, which is always nerve wracking as a parent, even though I love to do it too. Mazzy worked up the courage to try the jumping course. It takes a lot of commitment to go over those big hills with enough speed to get air. The first time Mazzy tried, she slid backwards down the same way she came, and the second time, she went over but never got off the ground. The third time, she got enough speed, got air and stuck the landing TWICE, with a line of people waiting and watching, mind you. You can easily cop out and go over the hill without the ramp (that’s where I am skiing beside her) but Mazzy went for it. So, she might not be doing a twist or a flip, but as someone who has been skiing my whole life and never been brave enough to take the ramp, I was really very impressed! You can watch her going over them in the video below. I also loved how when I asked her if she wanted to do it again, she said “no.” Getting it right once was enough! Then we went to lunch at Granite, which was a nice restaurant in the lodge by the Air Tram. We were told it’s a great restaurant to go in the summer as well, because the air tram works then too. After skiing, we took a dip in the hot tub, which is always one of our favorite things to do on a ski trip. There’s something really special about being in a pool in the snow. The best part is that we went outside without our shoes on, not realizing that we would actually have to run through the snow barefoot and in our bathing suits to get there. The snow was so high, it was like running through a snow tunnel carved out of the snow. Harlow was game but Mazzy did not want to do it. I practically forced her by yelling, “COME ON MAZZY, DO IT!! !” until she was practically in tears, because I did not want to wait with her in the cold. Not my finest parenting moment, but everyone was very happy once we were in the water! And then, of course, all they wanted to do was run in and out of the hot tub, dip their bodies int he snow and jump back in. Mazzy put a snowball down the back of my bathing suit to get back at me. Also, that’s not a white wall behind her. That’s how high the snow was in Lake Tahoe this year! On our last day in Lake Tahoe, we took the girls to a the Squaw snow park to go tubing and snowmobiling. Tubing was fun, but they have both done that before. It was the snowmobiling that was the real treat. Mazzy and Harlow looked hilarious in their helmets and goggles and could not believe that we were going to let them operate real motorized vehicles. I couldn’t really believe it either, but the track was tiny, they were the only ones on it and it seemed pretty safe. Mazzy and Harlow were so into the snow mobiles, they would have gone around that little track forever if we let them. I think that was their favorite thing we did in Lake Tahoe. That night we went to one more big meal with my stepbrother and family at the Blue Agave, a kitchy Mexican restaurant in Tahoe City. The kids laughed and laughed together and then hugged goodbye at the end of the meal. We were moving onto the next leg of our trip, but hopefully we will all ski together again. In the morning, we stopped at Fire Sign Cafe for breakfast, which serves some truly great eggs and pancakes, and then we headed out for the four hour road trip to Yosemite. A huge thank you to Visit California and Squaw Valley Alpine Meadows for showing us such a good time. Everyone should check out the Visit California site for more family travel ideas. You can also check out my family itineraries for Monterey, LA and San Diego. Stay tuned for my Yosemite itinerary next week! Oh, and I think travel stories would make great podcast material, too! !